In 1940, the British biologist Peter Medawar was called upon to consult on a severely burned airman whose plane crashed near Medawar’s Oxford home during the Battle of Britain. This led to a series of studies in which he and a colleague experimented with skin grafts and their sustainability. They observed that when the burn victim received a graft of his own skin (an autograft), it was successfully retained. By contrast, skin grafts from an unrelated donor failed to graft permanently and were rejected within two weeks; subsequent grafts were rejected even more rapidly. Medawar suspected that an underlying immunological reaction was responsible and later found that by suppressing this reaction with cortisone-like drugs, he could delay the rejection of the graft. Working independently during the 1940s, Frank Macfarlane Burnet, an Australian virologist, was intrigued by immune tolerance in pregnancy, where the fetus and placenta—both foreign tissues—are not rejected by the maternal immune system. He introduced the concepts of self andnon-self to immunology, which helped to explain autoimmunity, where the body generates antibodies against its own tissues, viewing them as non-self and attempting to destroy them. Burnet had established the theoretical basis for acquired immunological tolerance. In 1953, Medawar provided experimental supporting evidence for this theory, which lead to successful transplantation of solid organs, and for which they were co-recipient awardees of the 1960 Nobel Prize. Medawar established that during embryonic development, and shortly after birth, immune cells develop that can destroy foreign (non-self) cells. In his key experiment in 1953, Medawar injected tissue cells from adult mice (donors) into developing mouse embryos (recipients). After birth, the recipient mice were able to tolerate skin grafts from their donors but rejected grafts from other unrelated mice. These results established acquired immunological tolerance and provided the basis for later work that developed approaches for suppressing the rejection of organ and tissue transplants. SEE ALSO: Placenta (1651), Innate Immunity (1882), Adaptive Immunity (1897), Ehrlich’s Side-Chain Theory (1897). 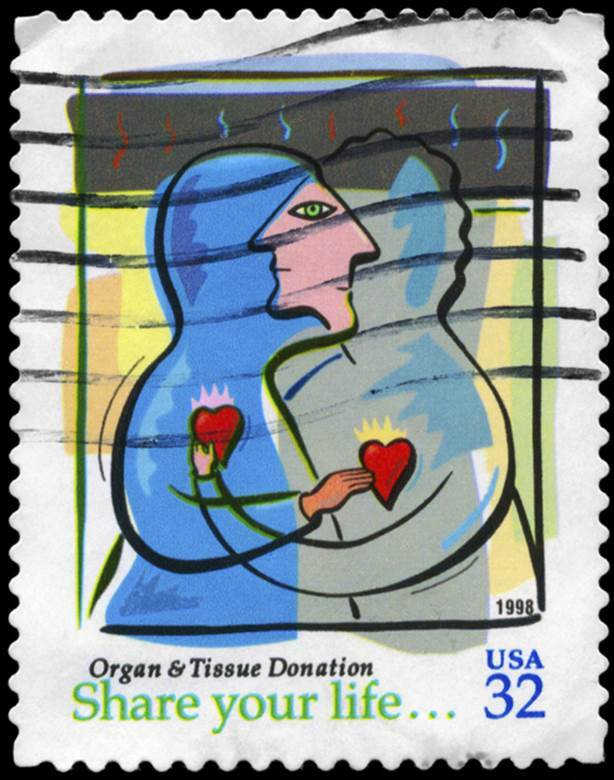 This c. 1998 USA stamp promoted organ and tissue donation. Organs that can be transplanted include kidneys, heart, lungs, liver, pancreas, and intestines, while transplantable tissues include corneas, heart valves, bone, cartilage, and ligaments.